We are on the road to the east coast and somehow these photos did not upload right on the website so I am posting them here. When we get back I will be able to make such updates from the main computer. 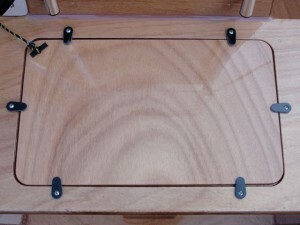 Here is the windshield photo and a photo of a hatch with the watertight gasket and custom machined turn-dogs installed. These photos relate to the kit details page linked from the PT Skiff page of the website (or click on the photo here in) and are options available in addition to the base kit. Thank you for your patience! Best to all, Ashlyn & Russell. 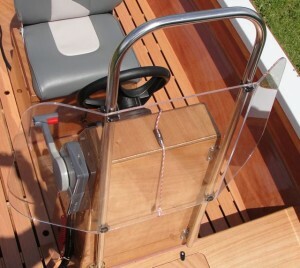 Plexiglass windshield with adjustable height on a welded stainless bar.